Whether your driver drops you to work in a car, or you ride a second hand bicycle to the railway Station, we all are the same-same. Ashok is born and brought up in Mangaon, Raigad, and he is a graduate (BA). His father was a farmer, but due to inconsistent rains his elder brother migrated to Mumbai, and when Ashok reached adulthood he persuaded Ashok too to leave their village and migrate to Mumbai to earn a more secure livelihood. Eventually, all 3 brothers migrated. When Ashok first arrived in Mumbai 15 to 20 years ago, he worked as a DTP operator, as he had typing skills. When that opportunity shut down, he found a job as a courier with Vichare at Bandra west. He is employed with them ever since. Ashok’s wife works, and his two children, a boy (10) and girl, are studying in school. How did I meet this gentleman? Hmmmmm. Well…. On my nearly daily walks or bicycle rides, or on my way home in the evenings in my car, I began to notice a short, thin ‘like a lady finger’, man with a big bag of letters and parcels walking around the lanes of Perry Cross Road, Rajan Sherley, St Andrews’ streets. He had a gentle walk, never seemed in a hurry, yet focused on a destination. Like a stream trickles along in no hurry in serene country sides, singing a charming tune. 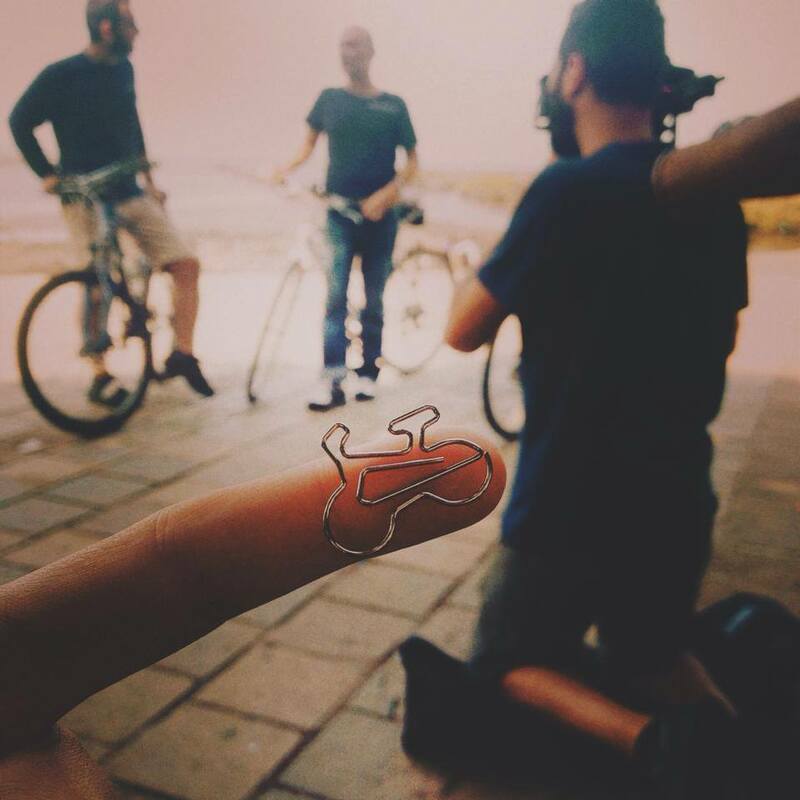 However, when I began to look at his face more keenly, now that he had come into our, Bicycle Angels’ ‘horizon’, I began to notice how fatigued he was. Always profusely-sweating. I began to wonder, how much these courier delivery persons must be walking daily!? Their employers may be paying them BEST or auto rickshaw fare, but I think maybe many of these couriers walk just to save that money too. I stopped a couple of times on my walks when I happened to see Ashok, and began to chat with him. I realized over a few weeks, he does not use a bicycle at work. Most importantly, if he rides on a bike daily to the station, he will save Rs 700 – 750 a month. When your salary is in the early thousands, saving Rs 750 a month matters a lot. For me, these were good enough reasons to help Ashok and or his children. His son and daughter will be able to ride the kind of cool looking bicycle I had in mind to buy for this particular recipient. Since he did not really need a Hercules or Atlas kind of livelihood bicycle to carry mostly letters. So, we purchased one just like that for him, and Ashok too contributed nominally towards this purchase. Coming back to Ashok, he made me once again realize, how important it is to offer water to couriers, postman, delivery boys, or even just ask them ‘Kaise ho?’ how are you, once in a while. They remember this random kindness shown by us privileged people, who they serve, immensely, he too told me. I asked Ashok, what is the best thing about his children? Amongst the things he mentioned, what stood out for me was, he said his son goes to school and comes straight back home, and he does not hang with the kind of elements around their locality that most people of his status perceive or know to be taporis, goons, delinquents. And I thought, hmmmm now that is exactly the fear of a parent known to me whose son goes to a most prestigious school at BKC. She is glad her son does not hang with some elements from his school that she perceives can be a bad influence on her son. These kids she fears, they arrive in a Range Rover. Thank you to Priyanka/Advait Chaturvedi, Neelam Soorma, and Surabhi Shah, for purchasing this wonderful cool bicycle for Ashok and his two children to utilize as they please. Phaguni’s father works at Gurgaon as Housekeeping staff. She accompanied them to Gurgaon in order to help the family in their hour of need. She has studied till the 9th standard, and now even she has started working in Gurgaon as a full time maid and part time cook to help her family make ends meet. Around three months ago, Phaguni got married to Devovrat, who has also moved to Guargaon from west Bengal in search of a better living. Phaguni reaches her workplace at 6 in the morning, and finishes work at around 8 in the evening. Phaguni’s husband walks with her to her workplace in the morning, which is approximately 3 kms from their home. And in the evening her mother in law walks her back to home. So that she be safe on the streets. On a bicycle, even though alone, she will be far safer and independent, and even reach faster. During my conversation with them, husband and wife, I asked them if they have any plans of extending their family, having children; to which they clearly replied that they have got other liabilities for now, and till they first get free from them they will not plan to extend their family. I was happy to hear that this young working couple is mature and understands their responsibilities and their liabilities. Since Phaguni is a cook, I asked her husband Devovrat, what is the best thing she cooks for him? Thanks a ton to my colleague Nitin Gautam, who came forward willingly to finance this bicycle for Phaguni. 142nd recipient – “When dealing with a disability, you look for things to hold onto”. “When dealing with a disability, you look for things to hold onto”. Munna lives at Bal Anand, an orphanage at Chembur. His caretaker, a lady, Mrs Priyanka Jagtap, brings six orphans from the Chembur orphanage to a school in Bandra west, daily, in a rickshaw. The school (ADAPT) gives these children free therapy and some level of motor-skills and education. There are more than a dozen children, at this Chembur orphanage, who have CP, but only six are capable of travelling beyond their orphanage to this school in Bandra for special children. The other orphans who have CP are either too small or cannot hold their head in place, due to muscular weakness that is caused by CP. So they do not have the good fortune of feeling the wind in the face travelling in a rickshaw, or having a glimpse of open skies and direct sunlight like these 6 fortunate souls amongst them do. Let us look at the positives. Experiencing this donation was a reminder for me, once again, never to take my ability to walk, or my ability to be able to go to the toilet and pee or bathe myself, or to be able to eat my food by myself, or drink water myself, for granted. Cycling toh is nothing less than a miracle I now believe. Munna’s caretaker, Mrs Priyanka Jagtap, to me seemed to be someone who was volunteering at the Orphanage; so I asked her, what made her choose this as her profession, looking after these special, CP, children, that too orphans. They need so much more love, compassion, attention, patience than able bodied and able minded children. Mrs Jagtap told me, “When I was pregnant with my second child, our doctor suspected my child may be born with a defect, like CP. We were very worried. My husband told me to keep the faith all will be well. My child was born normal. That is when I decided, if God has been kind to me, saved me from having a CP child, I must look after CP children, especially those who have no parents. I am bringing up my children with proper education and all, so I felt I must do something for orphans and particularly those who have CP. As I watched a smiling Munna walk away with the aid of his brand new Walker, however slow he walked, he walked without human support. When dealing with a disability, you look for things to hold onto. Munna holds on to a Walker to deal with his own. For Mrs Jagtap, it is gratitude she holds on to, to be able to serve special and orphaned children. The service Mrs Jagtap’s provides to these CP orphans is her gift for dealing with the gift of having ‘normal’ able children. 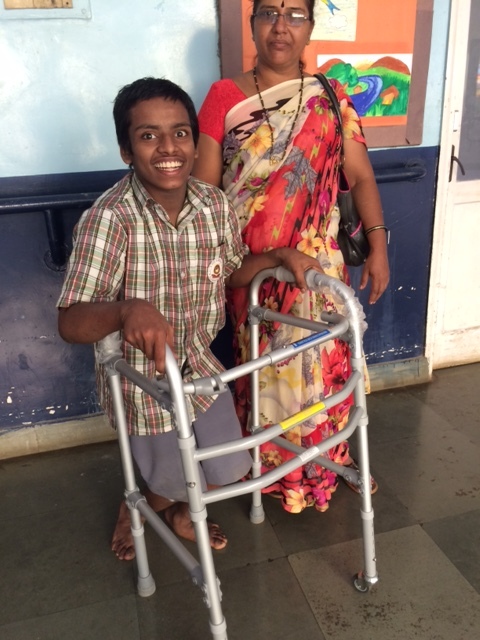 Thank you Dr Niraj Vora for purchasing this Walker for little Munna. 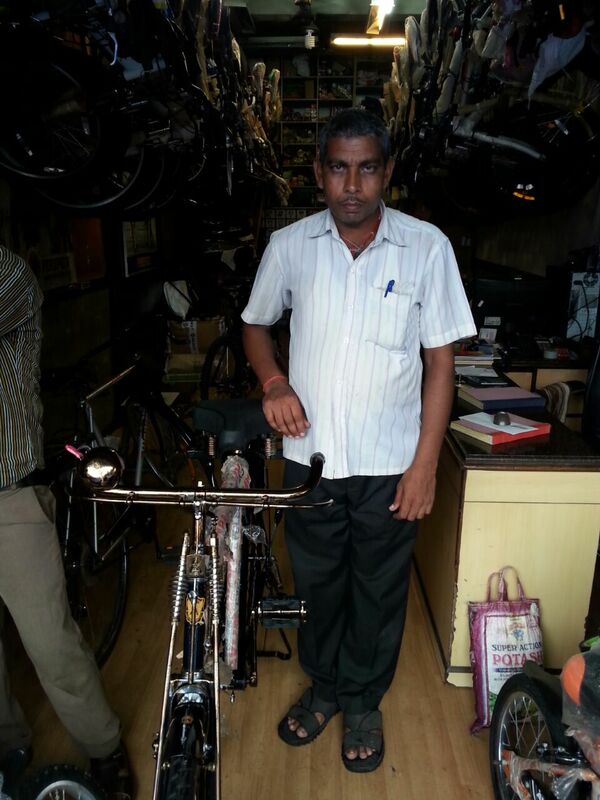 141st recipient of livelihood bicycle – Promises. Gurusevak is from UP. His bicycle frame was broken, and welded at the joints. And his bicycle was old. 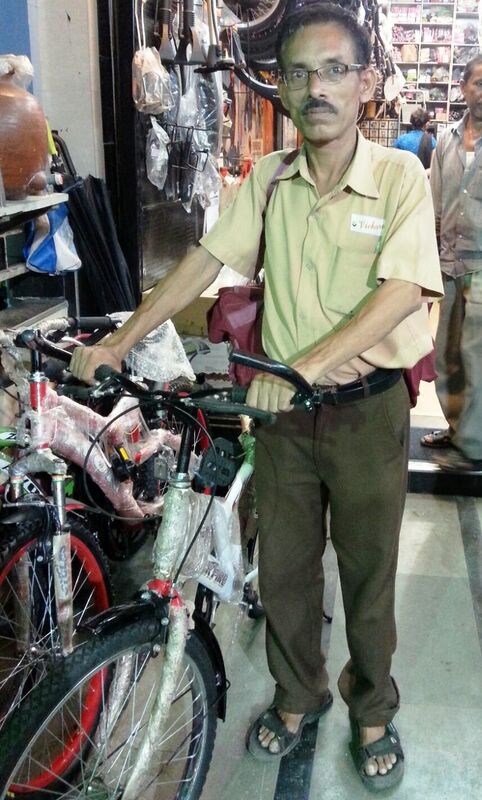 So we thought we can extend our small helping hand to him, especially since he was willing to contribute nearly half the cost of the new bicycle that we were willing to buy for him. A cracked frame of a bicycle, welded together, however well a job done, by the best of engineers, cannot bear weight or sudden jerks on the road any longer, reliably. Gurusevak’s father was a Dhobi too, and before he got old he inculcated his son, Gurusevak, into his profession. Gurusevak has been a Dhobi since 1995, when he first arrived in Mumbai, after studying till the 10th class. His family owned a small quantity of land back in the village and cultivated it. However, agriculture has often not served well enough to sustain their family’s needs, and their dreams. Two brothers, and five sisters, and his parents; that, comprised their family. Gurusevak will have to migrate to a big city and earn a better and more reliable livelihood, his family decided for him then though he was a teenager. Invariably, or most often, I think, everything that happens to us makes our lives better. Yes, not always and not for everyone. Gurusevak and his father ran their dhobi profession together from their rented quarters at Bandra west, and eventually they got his five sisters married from this income, that agriculture may never have bequeathed them. Gurusevak got married too. Father and son, along with their God, built their family’s destiny together. Gurusevak has two sons and a daughter, and is educating them all. Gurusevak’s father passed away early this year. He died instantly suffering a heart attack during a wedding event at their village. Without a goodbye. Two or more years ago Gurusevak had purchased a room in a lower income area in Bandra west. Not a house. A room. Over the last two years, ever since I began meeting these professionals (who use a bicycle to ferry their goods of trade, milk, bread, eggs, etc) and assist them in our own minor way, I realized that most of them live in a single room. And, that is why, they, unlike us privileged beings, very often when they talk about their house to me, they describe, address their HOUSE, to me as room. It took me half my lifetime to realize that most of these daily-wages-professionals reside in a single room. The toilet is community-shared, and their ‘kitchen’ is in one corner of that single room, their ‘bedroom’ the other corner, and most often the third corner of their room is occupied by their livelihood bicycle. Their only mode of transport for self and their goods of trade is the safest indoors. Living so close to the streets their bicycles get robbed very often. And the day they can’t ride, they don’t earn. Hence, their secure their bicycles like we secure our party-time vehicles. In the two years that Gurusevak did not travel to his village to see his family, his children and his father did tell him often to come visit them in the village. As I watched this deserving fellow ride away on his new bicycle, I reflected upon a common man’s need to keep his promise because of ‘izzat ka sawaal’ and or the financial implications of not paying back a loan or installment in time. Here was a father and son who built their family’s destiny together, sharing a bicycle between themselves, and sharing the load on it nearly for an entire lifetime, considering Gurusevak had been working ever since he was a teen or young adult. However, they could not share a last goodbye. I wondered, as I saw Gurusevak melt away into Mumbai’s traffic, what could be going on in the mind of someone whose closest relative leaves without a goodbye? 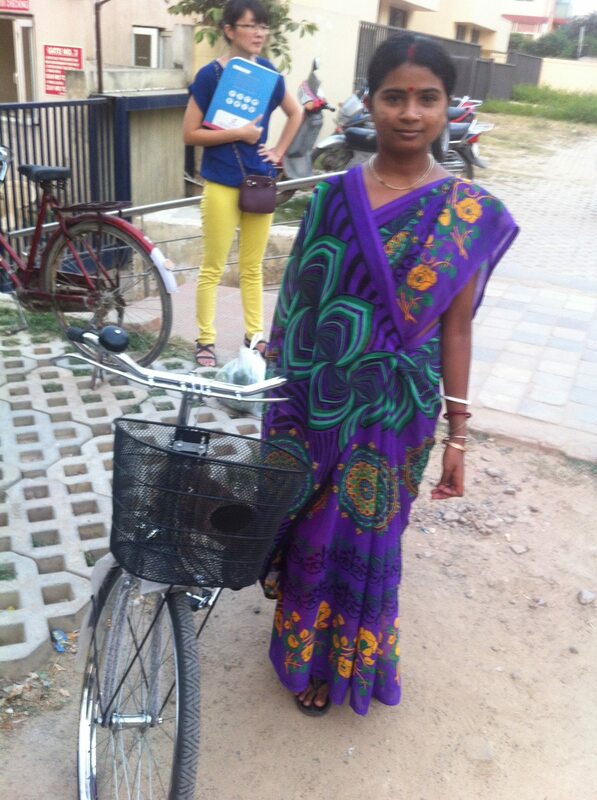 Thank you to Surabhi Shah and Parag Parekh for contributing towards Gurusevak’s new bicycle. He contributed nearly half its cost.